In order to provide prospective students with the best chance at having a great education, we have compiled this list of the top universities and colleges in New York. Some schools may excel at online programs while others may focus exclusively on the traditional, on-campus aspect of higher education. Regardless of the delivery format, these schools excel at providing a quality education for their students. Life is filled with innumerable responsibilities. That could include going to work every day, taking care of your family, cleaning your home, and countless other things. You know you should earn a college degree, but how can you find the time it takes to earn your degree while balancing everything else on your plate? Opportunities for completing degrees online have become more abundant than ever! You can complete your degree on your own time, at your own pace, and anywhere you’d like. But how to choose the school that best fits your individual needs? That’s why we’ve created a list of traditional programs and online programs in New York to help you get the quality degree you want without the restriction of needing to attend a physical campus or keep to a rigid schedule. Online degrees are becoming more and more popular because of their flexibility and top-level quality. So whether you’re a traditional student looking for a non-traditional experience, or an adult working full-time with a desire to learn, or anywhere in between, we have a solution for you! Take a look at the following schools included based on the qualities and offerings most important for you. Mercy College students have a personal mission: to get the most out of life by getting the most out of their education. Mercy was founded by the Sisters of Mercy in 1950 and is located on the Hudson River in New York. On average, Mercy costs are 50 percent less than that of other private colleges in the area. The White House named it a “Bright Spot in Hispanic Education” and has been recognized by the U.S. Department of Veterans Affairs as a “Yellow Ribbon School” and has consistently been recognized as one of the top schools for veterans and their families. SUNY Empire State College was established in 1971 by the SUNY Board of Trustees and then-chancellor and future United States Commissioner of Education, Ernest L. Boyer. It serves mostly working adults pursuing associate, bachelor’s and master’s degrees on site at 35 locations in New York state and abroad, as well as online everywhere. SUNY recognizes the value of work experience and has a clear process for assessing and awarding credit for college-level learning gained through that experience. Canisius College was founded in 1870 by German Jesuits, and is a premier private university in Western New York and is one of 28 Jesuit, Catholic colleges in the nation. In its 2017 ranking of Best Value Schools, US News & World Report places Canisius 8th out of 42 regional universities in the North, recognizing the college’s academic quality and the net cost of attendance. Canisius was also recognized for excellence in online education by The Community for Accredited Online Schools. The online publication ranked Canisius 4th on its 2016-17 list of Best Online Colleges in the nation. At Fashion Institute of Technology, the courses and faculty are precisely the same for students on campus as they are in the online program. FIT offers two online applications including a one-year Fashion Business Management associate’s degree for students who have already completed over 30 hours of college credit and a two-year bachelor’s program for an International Trade and Marketing degree for students who have already completed 60 hours of credit. Students can choose to begin their online courses at one of five varying start times throughout the year. Classes for the Fashion Business Management degree include Fashion to Business Practices, Advertising and Promotion, and Fundamentals of Textiles. Courses for the International Trade and Marketing degree include Statistical Analysis, Microeconomics, Global Sourcing, and Import/Export Regulations. Founded in 1870, St. John’s University is a Catholic and Vincentian university that is committed to serving those in need as St. Vincent de Paul did, and is committed to combating the root causes of injustice while helping to create a more equitable world. The majority of SJU’s online classes are taught by full-time faculty, 92 percent of which hold their doctorate or other terminal degrees. US News & World Report has ranked St. John’s graduate business, graduate education, and undergraduate online programs in the top 50 nationwide in their respective categories and in the category of Best Online Programs for Veterans. Pace University was founded in 1906 as a private university and began its transformation after World War II into a modern university with an emphasis on the liberal arts and sciences. It grew from rented facilities and few resources into one of the largest universities in New York State. It has a reputation for excellent teaching, drawing on the expertise of full-time and adjunct faculty members who balance academic preparation with professional experience to bring a unique dynamic to the classroom. Pace University is ranked in the top ten for the best online bachelor’s programs for veterans and is in the top 11 percent of U.S. colleges providing the best return on tuition investment. Columbia University was founded in 1754 as King’s College by royal charter of King George II of England and is one of the eight Ivy League schools. It is the oldest institution of higher learning in the state of New York and the fifth oldest in the United States. According to U.S. News & World Report, Columbia ranks 5th in its list of Best National Universities. SUNY Plattsburgh is a public, four-year college that enrolls over 5,000 students. Plattsburg offers plenty of student support through academic advising and financial aid. There are even honor programs for qualified students. Plattsburg offers four online degrees: BS in accounting, RN to BS., M.S. in Fitness and Wellness Leadership, and a certificate in Teacher Leadership. St. Bonaventure University is a private, Franciscan Catholic university. Bonaventure was founded in 1858 and has been instilling students with a real passion for learning and living ever since. All online classes are taught using the Moodle Learning Management System and can be completed 100% online to the students’ convenience. Students are provided with 24/7 technical assistance, an online success coach, and access to all library services. Saint John Fisher College is an independent institution of a Catholic fashion and is made up of five different schools. 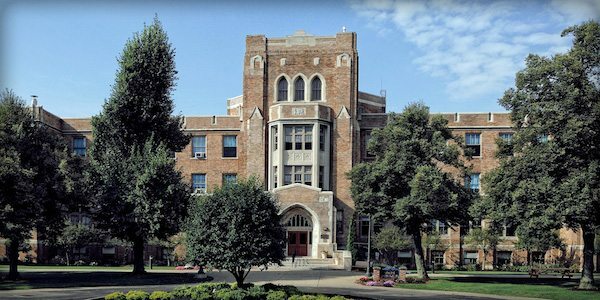 Founded in 1951, Fisher College is very devoted to its Basilian heritage and the education of its students. This school uses the online management system called BlackBoard which allows students real-time communication as they complete their studies online. The online assessments will typically be administered as discussions, projects, presentations, and group work. RIT was founded in 1829 and is a privately endowed, coeducational university with nine colleges emphasizing career education and experiential learning. It is an internationally recognized leader in preparing deaf and hard-of-hearing students for successful careers in professional and technical fields. In the 2017 edition, RIT was recognized as a top-tier national university for the first time in the 34-year history of U.S. News & World Report rankings. 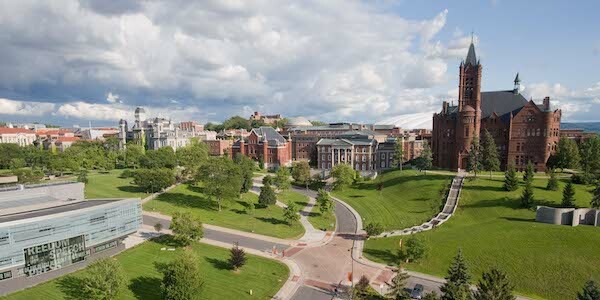 Syracuse University was founded in 1870 and was the first school to adopt one official color—a proud orange. It was also the first in the nation to offer a bachelor of fine arts degree and was the founder of the nation’s first iSchool. Though education was restricted to women in the 1800s, Syracuse included women in its education since 1870 and has recently been recognized as the No. 1 private school for military service members, veterans, and their families. Founded in 1831, NYU is now one of the largest private universities in the United States. From a student body of 158 during NYU’s very first semester, enrollment has grown to more than 50,000 students at three degree-granting campuses in New York City, Abu Dhabi, and Shanghai, and at study away sites in Africa, Asia, Australia, Europe, North and South America. Today, students come from every state in the union and from 133 foreign countries. It’s also been ranked as one of the most innovative schools among national universities by the U.S. News & World Report. Students can earn their aviation degree or a certificate at Vaughn College. There are five different degrees offered entirely online at Vaughn including studies like; Aviation Maintenance, Airport Management, and a certificate in Airport Management and Airline Management. The institution offers a variety of ways to learn including video conferencing, online video streaming, lectures on DVD, and access to SAKAI, an online course management system. Students can enroll either during the Fall or Spring semester for a 16-week course or during the summer for a 6-week session. The New York School of Interior Design offers a Basic Interior Design Certificate entirely online. This certificate program requires ten courses to finish the program; a few of these classes include; Basic Drafting, Textiles for Interiors, Design Process, and Color for Interiors. Students are not required to have a portfolio to apply to the program. Online courses for credit are available during the regular semester to start at Fall, Spring, and Summer. Fall and Spring semesters are 15 weeks long, and the Summer semester is only six weeks long. Most classes have one lecture each week, and students will be asked to interact with their classmates through an online course management system, or through conference calls and video calls. Stony Brook was established in 1957 as a college for the preparation of secondary school teachers of mathematics and science. It’s located on more than 1,000 acres of land on the north shore of Long Island. Stony Brook is responsible for over 2,000 inventions, and over 98 percent of its faculty members hold doctoral degrees or the highest degree in their field. It’s also ranked among the top 50 public national universities by U.S. News & World Report. Clarkson University was founded in 1896 as a memorial to Thomas S. Clarkson, a successful entrepreneur and Northern New York businessman who was also distinguished by a deep and abiding concern for humanity. It was ranked No. 19 on the U.S. News & World Report list of the best value schools (referring to national universities). Clarkson’s online classes, referred to as distance learning, is available to both degree and nondegree-seeking students. In November 1965, the public voted “YES” to the proposition of establishing a community college in Genesee County after a local debate of whether it should be a college or a vocational school. Genesee became one of only two voter-established community colleges in New York State. At Genesee, online learning is not a program in and of itself, but a means of completing coursework. Online classes follow the same rigorous schedule as campus-based classes. Medaille College was founded in 1875 by the Sisters of Saint Joseph as an institute for the preparation of teachers. Today, it’s a private, four-year college committed to serving the higher education needs of Western New York and the world and preparing students for tomorrow’s workforce. Online courses were introduced in 2010, and students have the option to take anywhere from one to four courses per semester. Students can also set their own schedules and are offered flexible payment plans. Tompkins Cortland Community College was founded in 1968 when two counties worked together to establish an institution of higher learning. By 1983 the university had grown to accommodate nearly 5,300 students with day and evening classes held at the main campus. Part of TC’s mission is “To inspire people to make the courageous choice to learn, grow, and serve.” Those looking for fully online certificates or associate degrees can start by looking at what this college has to offer! Founded by the Vincentian Community in 1856, Niagara University is a private liberal arts university with a strong, values-based Catholic tradition. It is also the only Western New York college or university with ministerial consent to offer its programs in the Province of Ontario. Its online courses are offered in 6-week increments with two lessons occurring every week, and courses start for as little as $99! Houghton College was founded in 1883 and offers a Christ-centered educational experience. Houghton has a 98% job placement rate after graduation, and 25% of students go on to become graduate students. Houghton offers six online degrees, five which are bachelor degrees and one which is an associate degree. Summer courses online are also offered for students who wish to accelerate their education. The New School, originally called The New School for Social Research, was founded in 1919 by a group of men who were frustrated with the intellectual timidity of traditional colleges. It was created as a school of advanced adult education to bring creative scholars together with citizens interested in improving their understanding of the key issues of the day through active questioning, debate, and discussion. Now it has seven schools and offers several degrees, certificates, and programs online. Roberts Wesleyan College was established in 1869 as Chili Seminary by Benjamin T. Roberts. It became Roberts Junior College in 1945 and then changed its name to Roberts Wesleyan College four years later when it obtained a charter to provide a four-year curriculum. Today it’s a private university that has a phenomenal student-to-faculty ratio of 11:1 and offers graduate degrees, undergraduate degrees, and certificates online. Marist College offers a bachelor’s program in Liberal Studies, and six master’s programs including; Communication, Business Administration, Public Administration, and Information Systems. The school also offers a few advanced certificates in Information Systems and Business Analytics. Some courses are provided on an accelerated, 10-week program, replacing the traditional 15-week schedule. Online learners have access to several resources online including an orientation of the course delivery program, a bookstore, and discussion forums with students and professors. Students should expect to spend 4 hours online in class and about 8-10 additional hours for homework. Finger Lakes Community College was founded in September of 1965. Its first Freshman class included only seven full-time faculty members and over 200 full-time and part-time students. Part of FLCC’s vision says that they “will offer an educational environment that is intentionally designed to engage [its] students as learners and propel them to completion.” FLCC’s online courses are part of the OPEN SUNY Plus campus and have gone through a rigorous process of quality assurance. In 1952 the Dominican College of Blauvelt was opened by the Dominican Sisters of Blauvelt as a three-year liberal arts college in the Catholic tradition, offering a teacher preparation program for religious women. The college was opened to lay students in 1957 and has since implemented other coursework and now offers several doctoral, master, bachelor, and associate degrees. Dominican College’s Online Program was ranked No.19 in the State of New York by BestColleges.com. Hofstra University was founded in 1935 and is a private, nonsectarian and coeducational institution. It’s the only university that has been chosen to host three consecutive U.S. presidential debates (2008, 2012, and 2016), and is in the top 24 percent nationwide for return on investment, according to the 2016-17 PayScale College ROI Report. It’s online graduate programs have been ranked among the best by the U.S. News & World Report. The State University of New York at Oswego was founded in 1861 as the Oswego Primary Teachers’ Training School by Edward Austin Sheldon. In 1942, state legislation elevated the institution from a normal school to the degree-granting Oswego State Teachers College. Oswego’s student body quadrupled during the 1960s and early 1970s, which was a busy time of building on campus as well—29 new buildings opened in the 1960s alone. SUNY College at Oswego has been selected as one of the first SUNY colleges to participate in Open SUNY – a SUNY-wide collaborative effort to provide online-enabled learning opportunities. SUNY at Delhi offers online bachelor’s programs in Nursing, Criminal Justice, and Hospitality Management. They also offer a master’s program in Nursing and an Associates degree in Occupational Studies. Online classes are open when the on-campus term starts each fall, winter, and spring semester, but students can take the courses at their own pace. Students have access to many online resources including online tutoring, library services, and academic advisement. Students access their online courses through an online management system called Moodle. Russell Sage College was founded in Troy, New York, in 1916 by Margaret Olivia Slocum Sage and named in honor of her late husband, who had left her his considerable fortune. With Eliza Kellas, Mrs. Sage was active in the women’s suffrage movement; in founding the new college, they wanted to offer women independence through the combination of broad education in the liberal arts with preparation for specific professional careers. During World War II, an “emergency men’s division” was created and in 1942 the first graduate degree was conferred. The college received its degree-granting power in 1957 and today offers students several certificates, bachelor’s, and master’s programs online. Currently, they have two operating campuses. The Russell Sage Campus, located in Troy, is an all-girls school but men are allowed to take classes on this campus. The Sage College of Albany Campus is a full co-ed school. Founded in Brooklyn in 1896, Adelphi is Long Island’s oldest private, coeducational university. U.S. News & World Report listed Adelphi as a Best College in its critique of 1,600 institutions, ranking the school in the top ten percent nationwide. Adelphi has also been recognized by the Fiske Guide to Colleges as one of the nation’s “best and most interesting” institutions and for 11 consecutive years has been listed among a select number of Best Buys in higher education (an award only 25 private institutions in the country receive each year). It offers several associates, bachelor’s, and master’s degrees online. Davis College emerged in 1900, then called Practical Bible Training School, from a series of Bible classes that were conducted in downtown Lestershire (Johnson City), New York by John A. Davis. These classes were engendered by the conviction that God would have a Bible institute established in the Binghamton area. With more than a hundred people attending, it was agreed that a school should be organized. In 1993, Practical Bible Training School was authorized to grant the two year Associate of Applied Science (AAS) degree and the four-year Bachelor of Religious Education (BRE) degree. The college continues to offer a one-year certificate in Bible and a three-year diploma. A major in Bible/Theology is at the core of all programs. In 2004, Practical Bible College became Davis College, a Practical College of Bible and Ministry. Founded by the Sisters of St. Joseph, the College opened its doors to 12 students in the Clinton Hill section of Brooklyn in 1916. It received its permanent charter from New York in 1929 and made the transformation to a coeducational college when it first admitted male students in 1968. SJC’s online library system was created in 1999 so students could access books from either of its campuses. SJC’s online presence has expanded, its bachelor degree programs now being rated among the best in the United States by the U.S. News & World Report. The City University of New York offers over 90 degrees, enrolls over 12,000 students, and is the largest urban system in the nation. Lehman College, one of the colleges within CUNY, is known for its exceptional online courses. CUNY offers online majors in liberal arts and science, and master programs in the arts, science, health fields, and teacher education. The College of Mount Saint Vincent is a Catholic, liberal arts college. It offers more than 70 bachelor’s, master’s, and post-master’s programs with 12 accelerated degree programs and a stunning 13:1 student-to-faculty ratio. It was founded in 1847 by the Sisters of Charity. Unfortunately, Vincent has little information on its online courses and degrees. SUNY Oneonta was established in 1889 and is a public, mid-sized college. Enrolling over 6,000 students, Oneonta has a diverse student population and a well-qualified faculty. Oneonta offers both undergraduate and graduate programs, both of which can be taken online with Oneonta’s revered and award-winning online programs for students’ flexibility and convenience. Trocaire College is a private, Catholic college that equips students for rewarding, well-paying careers in healthcare, business, hospitality and technology. Trocaire was founded in 1958 by the Sisters of Mercy– its name originated from the Gaelic word “mercy.” Approximately 97% of students receive financial aid, and the teacher-to-student ratio is an astonishing 10:1. Trocaire offers its BS, Nursing program online to best accommodate the scheduling needs of its students, many of whom are working nurses. In addition, support for all classes is offered through the online learning platform Moodle, and many courses from each of our academic programs are offered in an online format as well as in-person. D’Youville College is a private college founded in 1908. D’Youville offers bachelor’s, master’s and doctoral degrees as well as advanced certificates and structured minors. This college uses the online learning program Canvas and Moodle and offers 24/7 support. D’Youville is unique in the fact that it offers combined degrees, where students can get their BA and MBA in less time. Students can get their MBA or Nursing RN-to-BSN degrees online. Alfred State College was founded in 1945 and knows students are looking for flexible affordable, and valuable education. The online program at Alfred allows students to take 1-5 classes at a time in their own time so they can still fulfill their personal and professional obligations. All online classes are available in the fall, winter, spring, and summer on the Blackboard Learning System. If you are associated with a school on this list and would like to make edits or add additional information, or you would like to add your school’s program to our list, please contact us with additional information!